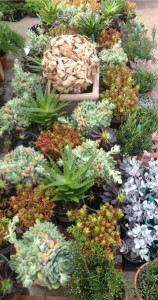 This latest offerings of sedums, echevarias, aeoniums and more from the west coast are, in a word, simply stunning. To be honest, had we known the quality, size and unbelievable color on these exceptional succulents, our order would have been much larger! 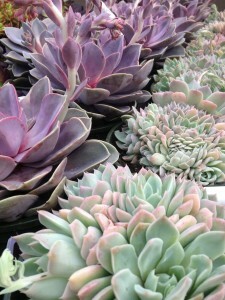 For you lucky folks who nab these now, you won’t be disappointed…hopefully these pictures will inspire you to try these or other succulents in your containers this year – we warn you though, these beauties can be addictive! 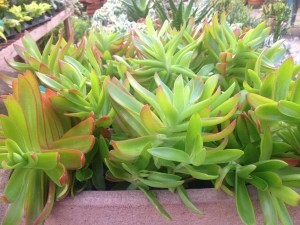 While this shipment probably won’t be around long, we’re always on the hunt for these tough and durable plants. Any of you who frequent us can attest to the fact that because of our small size, inventory changes rapidly – what may be here today, may not be here next week…in other words, you snooze, you lose! On the other hand, what we have down the road could be even more beautiful – that’s the fun of haunting your favorite garden shop! Who needs flowers with color like this? At any rate, the pictures here give you an idea of the beautiful range of color and texture in just this sampling. 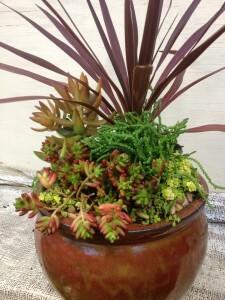 We hope the container plantings shown will give you inspiration to create your own this summer. 1. Plant in loose, well draining potting soil. 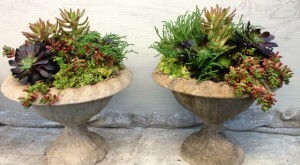 Please, no soil from your garden – it’s much too heavy for succulents. When you water, it needs to drain. 2. Water when the soil is dry, then water freely and leave it alone. If you’re not sure whether to water – wait a day. 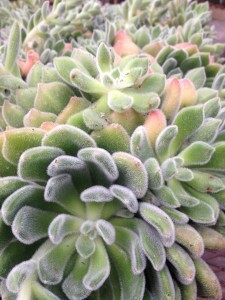 The fat leaves of succulents hold moisture. Having said that, you can’t ignore watering them either. 3. 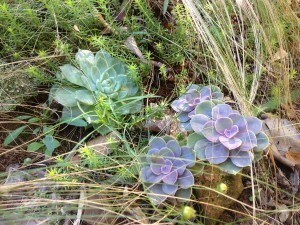 Many succulents prefer a bit if shade in the afternoon – we’ve discovered the hens’n’chicks definitely do. They all tolerate a degree of shade if they are not overwatered. 4. 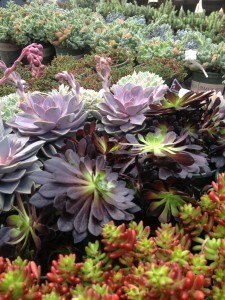 If you want to plant some in a pot, mix it up to vary the colors and textures. Also, pay attention to their growth habits – some are more upright while others trail and would do better along the edge of your planter. 5. Top dressing your planting with pebbles or pea gravel helps keep the soil surface dry. 6. Less fertilizer is best. Once every month with a low nitrogen formula mixed at half strength is enough. 7. If leaves or stems break off as you’re planting, let them sit out and dry for a day or two, then push into a small pot with well draining mix. 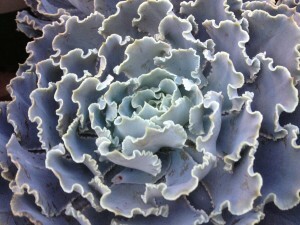 Keep an eye on it for new growth and do not overwater. 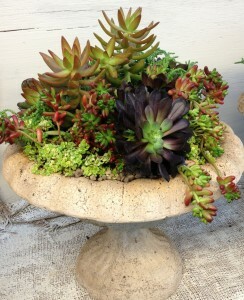 This entry was posted in Container, Succulents and tagged aeonium, color, containers, echevaria, sedum on March 18, 2013 by Kris Blevons.